Bay Area Express Lanes are free to qualifying carpools, vanpools and other toll-exempt vehicles and offer solo drivers the choice to pay for a more reliable trip with FasTrak®. 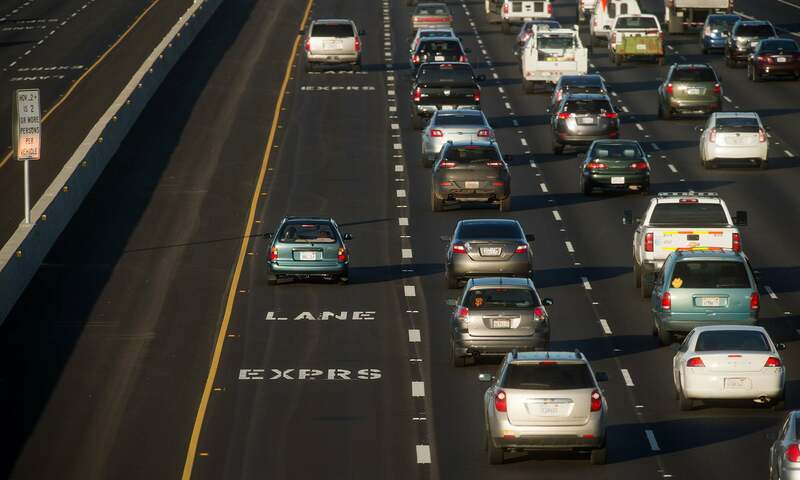 The Bay Area is planning a 550-mile network of Express Lanes by 2035 to increase highway efficiency by encouraging carpools and vanpools and by filling available capacity in carpool lanes with solo drivers choosing to pay a toll. MTC will be managing the Express Lanes currently under construction on Interstate 680, and planned for Interstates 80, 880 and a few other major highways and state routes in the region. Learn more about Express Lanes here. Bay Area commuters are invited to comment at two upcoming public hearings about tolls and the toll collection process for Express Lanes managed by MTC. The Bay Area Infrastructure Financing Authority (BAIFA) is proposing a Toll Facility Ordinance, which will establish tolls, penalties for toll evasion and policies that will guide the collection process. Under the proposed Toll Facility Ordinance, BAIFA is proposing a $0.30 minimum toll per zone on I-680 Express Lanes from San Ramon to Walnut Creek. Carpools and other eligible vehicles can enjoy toll-free access with a properly mounted FasTrak Flex toll tag or other method that accurately indicates a toll-exempt status. Read the full proposed Toll Facility Ordinance here. The public hearings will take place during BAIFA’s regular meetings on Wednesday, June 22, 2016 at 9:35 a.m. (or immediately following the 9:30 a.m. Bay Area Toll Authority meeting), and on Wednesday, July 27, 2016 at 9:30 a.m. at the Bay Area Metro Center at 375 Beale Street in San Francisco. Interested members of the public are also encouraged to send in written comments by July 20, 2016 to the Metropolitan Transportation Commission Public Information Office at 375 Beale Street, Suite 800, San Francisco, CA 94105, or via email at info@bayareametro.gov. View the full notice of public hearing here. After receiving comments, BAIFA will consider the adoption of the ordinance at its July 27, 2016 meeting. All wonderful - however there is little to no Toll/HOV law enforcement for abusers and there are many - whats the point if the CVC is not enforced. Don't spend my tax $$$ on these great idea unless the CVC is enforced and those of us obeying and abiding by the law are not abused by those not. A fine is not enough, after several abuses I would impound the abusers vehicle. I concur. The new one is not as appealing as the original. Also, why is it that on my cell phone when I search www.511.org it brings me to an address somewhere on 8th st in SF? Why doesn't it bring up the bay area map like on my desktop? Why did you change a perfectly good version of 511.org? This new version is terrible. Dear Mr. Dairiki, Thank you for your comments about the new 511.org website. Your input helps us develop a better understanding of customers’ experience with the site, which is vital in balancing travelers’ need for information with the limitations of public funding. Your suggestions are important us. Please take a moment to share any comments or concerns you have here: https://www.surveymonkey.com/r/PB2YYRL Your input will be forwarded to the appropriate staff for consideration.